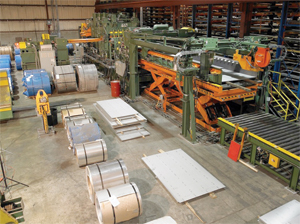 a supplier of stainless-steel sheet, plate, bar, structural, pipe and tubular products, has installed a heavy-gauge cut-to-length line from Herr-Voss Stamco. The line, which includes a precision leveler (with 4-in.-dia. work rolls), overhung mandrel-type uncoiler, three-roll breaker and entry-crop shear, will allow the firm to expand its leveling capabilities on surface-critical 2B sheet finish, and corrective leveling on 0.375-in. material, according to Penn Stainless president Jim Seward. Line capacity: 50,000-lb. coil weight, 78-in. wide, material thickness 0.090 to 0.375 in. Besides precision leveling, Penn Stainless offers plate and sheet shearing, plasma and waterjet cutting, and machine and saw cutting.